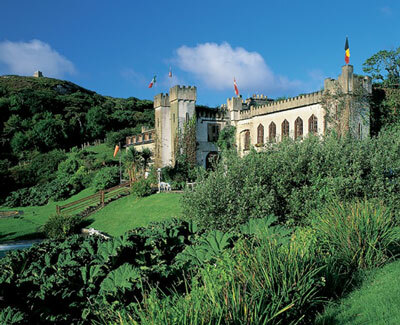 On the Sky Road ascending from Clifden, make a swift descent towards the sea to find yourself in the pleasant gardens of Abbeyglen Castle Hotel. On the Sky Road ascending from Clifden, make a swift descent towards the sea to find yourself in the pleasant gardens of Abbeyglen Castle Hotel. Bulit in 1832, Abbeyglen is owned and operated by two generations of the Hughes family and is renowned for the quality of its cuisine and choice of accommodation. Abbeyglen has 18 superior rooms, many with four poster beds, jacuzzi and open fires. You can enjoy most indoor and outdoor pursuits from a range of facilities at Abbeyglen. From its commanding position overlooking the village of Clifden - at the head of a magnificent bay against the mountainous backdrop of the "Twelve Bens" - Abbeyglen Castle Hotel is the ideal base for touring Connemara, one of the loveliest parts of Ireland blessed with a natural beauty. When the day?s activities are over and Abbeyglen beckons, be assured your care and comfort will be in practiced hands with the added attraction of a friendly welcome, complimentary afternoon tea, gourmet cuisine, Steinway sounds and unrivalled atmosphere.